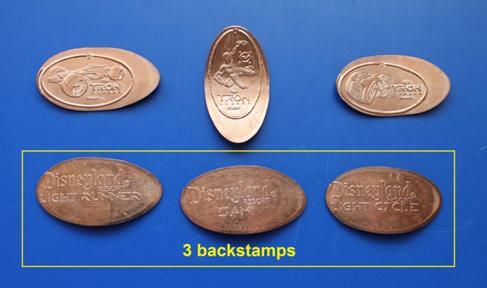 Set #DL08mx: pressed on circulated obsolete brass Mexican 5-centavo coins from 1970 to 1976. All are circulated and have varying degrees of muck, stains, and dirt - but it's neat to have these designs on a different style of metal that’s the same size as a dime. Set #DL08ch: pressed on uncirculated Chinese aluminum 1-fen coins from 2008 – the same size as an American dime! Indy crossed swords, hat, whip. This set collects 8 designs from the Opera House, representing the 8 lands of Disneyland. All of these roll short – the “Disney” at the bottom is generally missing. This is the set with the revised dies from November. Pressed on uncirculated U.S. nickels. Pressed on circulated cleaned copper pennies. Many show visible signs of streaking. The railroad station closed for refurbishment in late January. All quarters are rolled on slightly circulated but very clean state and national park quarters. 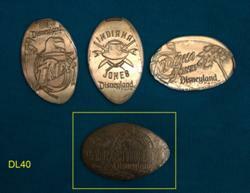 Also available: a set of 3 Frozen dimes from California Adventure. All dimes are rolled on slightly circulated but very clean dimes. The store is called Adventureland Bazaar. The machine is called Rajah’s Mint and has three sides with three machines. 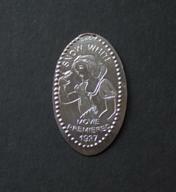 An elephant on the top loudly hammers out a coin when you make your pressed penny. 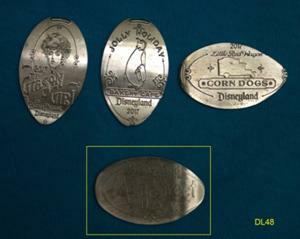 These same designs have been used at Disney World, but here they have the Disneyland label and a Frontierland backstamp. 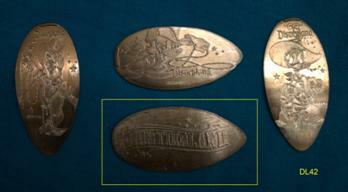 The coins feature three trains from Big Thunder Railroad: I.M Loco, U.B. Bold, and U.R. Darling. Retired; replaced in May 2015 by 60th anniversary coins. When the 60th anniversary coins were retired in September 2016, a new set of Pirates coins was installed. Set of 3 from the Pooh Corner store. Complete set of 3 from the ride exit. The machine at this location is animated – the coin falls down the water feature while screaming. The 3 Tron coins have unique backstamps. 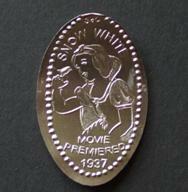 Similar designs were available at Disney’s Hollywood Studios, but are now retired. This gift shop, part of the Tropicana Inn & Suites across from the old Disneyland entrance on Harbor Boulevard, has a nickel machine. 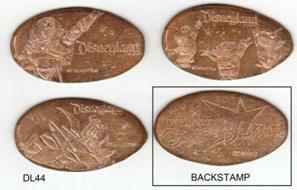 All three coins have a reference to Disneyland, making this a popular set with Disneyland collectors. 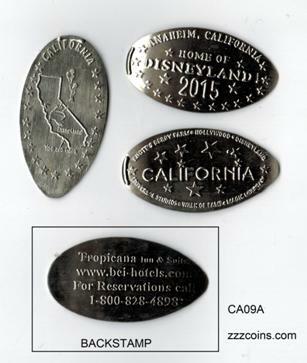 All designs have a backstamp with the hotel’s information. Rolled on uncirculated nickels. All roll slightly short. The 2014 coin (DW0038) was replaced with a 2015 coin in February 2015 (DW0041). I expect a 2016 coin will replace it, but I have not been back to confirm this. These rolled much better than the 2014 version. Rolled on uncirculated nickels from fresh bank rolls. 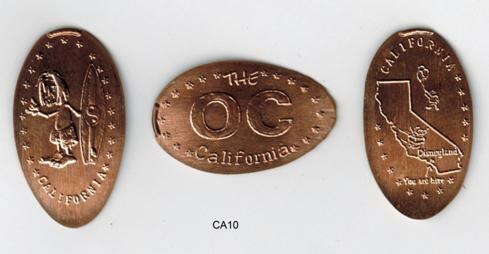 This hotel across from Disneyland has a 3-die machine that includes the popular “Surfer Dude” penny. 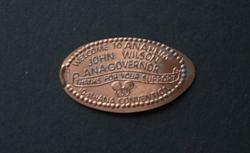 The California map design mentions Disneyland, earning this a place in the ParkPennies web catalog. Many Ebay sellers advertise these as Disneyland coins and charge $5 apiece. They aren’t, and I won't. Rolled on uncirculated copper cents and sold at a low price . . .